Dr. Eunice A Ampiaw, MD is a Doctor primarily located in Columbus, GA. She has 26 years of experience. Her specialties include Family Medicine. She speaks English. Dr. Ampiaw has received 8 awards. The overall average patient rating of Dr. Eunice A Ampiaw is Excellent. Dr. Eunice A Ampiaw has been rated by 33 patients. From those 33 patients 11 of those left a comment along with their rating. The overall rating for Dr. Eunice A Ampiaw is 4.8 of 5.0 stars. My entire family are patients of Dr. Ampiaw. Best MD I have ever dealt with. She is a doctor you can trust. Dr Ampiaw is a fantastic doctor. I have been a patient for many years. I have enjoyed my relationship with Dr. Ampiaw, however due to my experience now with Columbus Clinic I am considering changing doctor for this reason. The service at Columbus Clinic is my issue. Phone calls do not get returned. The wait time is getting horrible because patient are stack up. I waited an 1 hour 25 minutes this morning and had to leave without seeing my doctor because I had another appt to get to. What is an acceptable wait time? Also had to cancel another appt a few weeks ago with another specialists because I never got a call back for information that I needed. I tried to cancel on the portal but had problems with the portal.. Many issues with Columbus Clinic.... I hate this and it is bitter sweet. I have been a patient under Doctor Ampiaw's care for eight years. She is among the most reliable and best health care officials in the world!!! Create a fifth STAR - TOTAL AWESOME MD!!! Three stars on ease of appointment because... No MD can handle the entire world. My entire family are patients of Dr. Ampiaw. She is awesome. I didn't rate her 4 stars on ease of appointments because it's no fault of hers. Although you have options to see a PA, I'd rather not. You always leave with an accurate diagnosis and she makes you feel that she truly has your best interest. As her patient you never feel rushed. She is very easy to talk to and she will get on to you when your not doing the right thing. She has a wonderful bedside manner and she is great with kids of all ages. My son is 17 and very comfortable with her. She is A family Doctor. One you can trust. 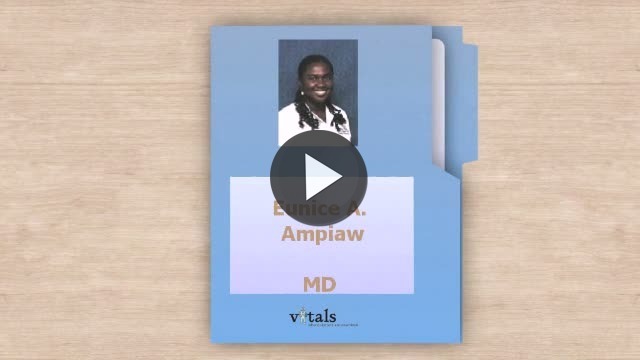 Take a minute to learn about Dr. Eunice A Ampiaw, MD - Family Medicine in Columbus, GA, in this video. Dr. Eunice A Ampiaw is similar to the following 4 Doctors near Columbus, GA.
Have you had a recent visit with Dr. Eunice A Ampiaw? Select a star to let us know how it was.